The primary function to date has been to supply donated books and literacy materials to the Botswana people through their schools and other educational institutions. These resources are fundamental for developing an educated and informed nation (VISION 2016). The materials are secured from various donors such as Books for Africa and the shipping costs are paid by American donors who believe in global literacy and have contributed to the Project through Books For Africa. These materials are offered freely to schools and other charitable organizations throughout Botswana. The materials may include used books, computers, and school and health curriculum support items such as art supplies. 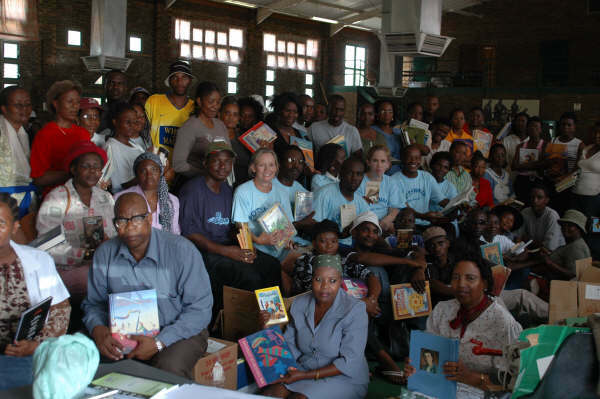 The Botswana Book Project has also played a key role in assisting schools and communities in creating libraries. -Development of library and reading promotional materials. -Promotion of the Regional Library Committee. -Establishment of a permanent Book Project storage facility at Maun Senior Secondary School. The Book Project now distributes books from Baobab Primary School in Gabarone. Book recipients, including Peace Corps volunteers and the National Library Service, collect their books there.